Taal has always been associated to the lake and the smallest volcano. Underrated and unknown to some, there is a small heritage town in Batangas which harbors the largest Catholic church in Asia. On board a tricycle from Lemery, Batangas (PhP10.00 fare/head), we passed by a concrete narrow path of aligned colonial houses and from a distance, an imposing landmark peeks through a canopy of trees. 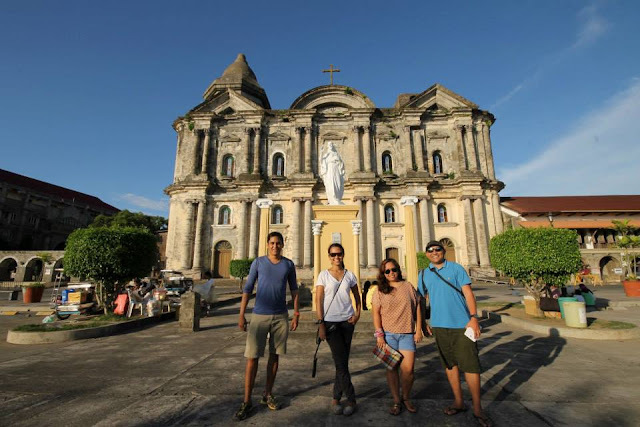 Situated atop a hill, the landmark is named after the town’s patron saint, Saint Martin de Tours, abridged as Taal Basilica. Walking through the town of Taal, we reached the church and climbed a few concrete steps. Immediately, we glanced in astonishment at the grand façade of the Taal Basilica. It resembles the St. Peter’s Basilica in Rome. Apart from its façade and size, the church is likewise known for another large item - a bell. Commonly referred to as the “king of the bell”, the massive instrument is 19 feet (5.8m) in circumference at the lip, 9.33 feet (2.84 m) around the crown and 6.42 feet (1.96m) in height. The huge bell necessarily imposes itself as part of the landscape as it is positioned at the front of the church. I am actually uncertain if this is a replica or the actual bell that fell from the belfry on account of the 1942 earthquake. It was a weekday. Though devotees are less in number on that day, what surrounds is a scenario of local peddlers, students and tourists that co-exist. It appears like a plaza (public square). The nave as complemented by its high ceiling and intricate hand paintings as ornaments even more enhanced the beauty of the church. Main attraction as well (if attraction it could be said) is the silver tabernacle, said to be the only one of its kind in the country. It took us 30 minutes to roam around and offer a short prayer while inside the church. To witness an ongoing photo shoot of newly-weds while we leave as we passed by the large wooden door is part of the experience. The church is a popular choice of wedding rites and vows. Tall Basilica is likewise surrounded by a Taal Cultural Center housed of a colonial architecture and a park, where its imposing signage is prominently displayed at the foreground. The Municipal Hall of Taal is likewise right across the church. The typical rural setting during the Spanish colonial times is what you envision while at the said vicinity. And the Basilica of Saint Martin of Tours is one of the remnants of Spanish colonization.